Parcheesi is a brand-name American adaptation of the Indian cross and circle board game Pachisi, published by Parker Brothers and Winning Moves. Created in India perhaps as early as A.D. 500, Pachisi is called the Royal Game of India because royalty used servants of the royal household adorned in colored costumes as game pieces on large outdoor boards. Such a court is preserved at the Fatehpur Sikri. The game and its variants are known worldwide. A similar game called Parchís is popular in Spain and northern Morocco. Parqués is its Colombian variant. A version is available in the United Kingdom under the name of Ludo. 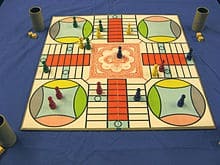 Parcheesi is typically played with two dice, four pawns per player and a board with a track around the outside, four corner spaces and four "home paths" leading to a central end space. The most popular Parcheesi boards in America have 68 spaces around the edge of the board, 12 of which are darkened "safe spaces" where a piece cannot be captured. The goal of the game is to move all of one's pawns "home" to the center space. A player's pieces enter play on the darkened space to the left of the player's "nest", or starting area, and continue counter-clockwise around the board until they reach the home path directly in front of the player. The game is played best with four players. Fewer players create dead areas on the playing board. Each player rolls a single die to determine player order. The player with the highest roll goes first and the order of players' turns move to the next player on the current player's left. Each player positions their four single colored pawns in the round starting nest of the same color. Pawns move from the nest to the same colored starting space to the left of the nest, by the movement rules in the following section. A turn ends when the next player rolls the dice with the consent of the current player. Any rewards not taken are lost. Only pawns not in the nest may move forward on the board. Pawns may only leave the nest with a roll of a five on a single die or the sum of the dice. A double five can be used to move two pawns from the nest simultaneously. A player may move one or two pawns with a single roll of the dice (with the exception when doubles are rolled), one by the number rolled on one or both dice and another by the number rolled on the other die. The roll and turn is forfeited if no move can be made. All die rolls must be taken and may not be voluntarily be forfeited by a player. If either of two rolls must be forfeited, the player must forfeit the lower number. All die moves must be taken before the application of any extra rewards for sending an opponent to their nest or moving a pawn to its home position. A roll of doubles merits the player a total of fourteen spaces, which may be taken by a single pawn as a whole or split between two, three, or four pawns by the numbers of the top die faces and opposite die faces. The total of the pips on opposite sides of a die always adds to seven. If the player rolls three doubles in a single turn, the third double is forfeited and the most advanced pawn, unless it is in the protected home row, must be sent back to the nest. A blockade is formed when two pawns of a single player occupy the same space. No pawn of any player may move through a blockade, including pawns of the blockade owner. Blockade pawns may not be moved forward in unison with the roll of a double. Another player's pawn cannot land in a space occupied by a blockade. Local rules may limit the number of turns that a blockade can stay in place. A pawn is not required to enter the home row and can pass the row and start another circuit of the board voluntarily or as the result of requirement of the use of the total die roll. The reward for sending an opponent's piece to the nest is a free move of twenty spaces that may not be split between pawns. The reward for landing a pawn in the home space is a free move of ten spaces that may not be split between pawns. Moving all four pawns to the home position wins the game. Pawns may only be moved to the home position with an exact application of the total roll, the value on a single die, or the complete application of a reward.